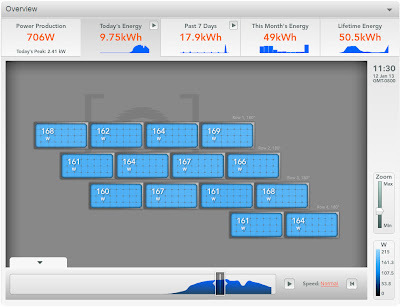 This tutorial discusses a simple approach to working with your Enphase data. Enphase data is data that your solar array sends up into the cloud (Enphase servers) when your system uses the Enphase Envoy Communications Gateway (http://enphase.com/products/envoy/) with your Enphase microinverters. This system allows solar array owners to check the status of their system and view various aspects of the system's performance. 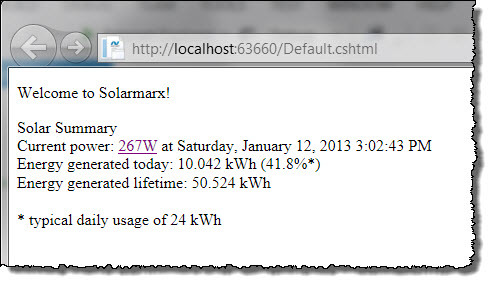 We recently installed 14 solar panels working with Solterra Systems and we were curious about how to access our data. It proved to be fairly straightforward. With a little programming background you can work with the data as you want, for example, exposing it in web pages and applications. 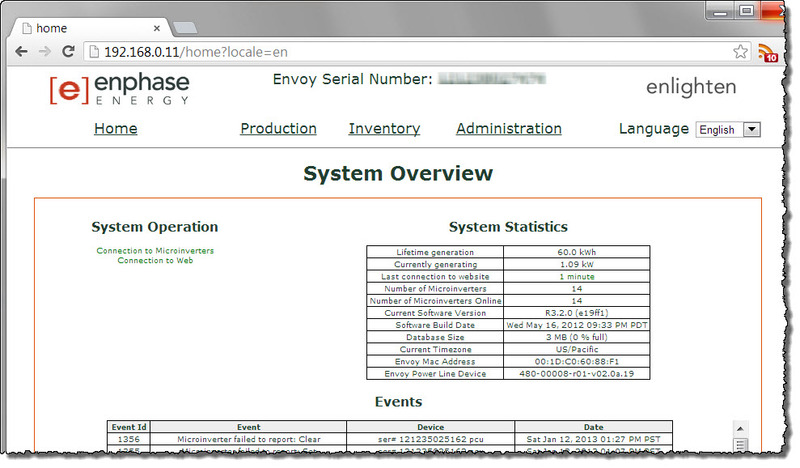 The next easiest non-programming approach is to log on, locally, to your Enphase Envoy gateway device and view your data. This only works when you are at home, on your own network. Home page - System statistics and events. 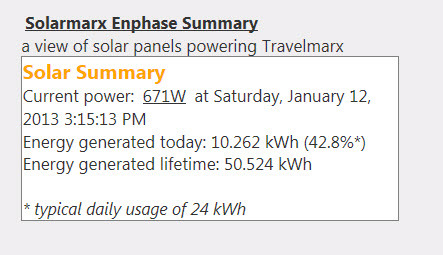 Inventory page - list of solar array panels (at least for us). It seems strange to have data about something physically near us pump its data out to the Internet where we then access back through the Internet. Why do we do this? Because the local data isn't easily consumable in any practical form other than viewing it in a browser. What we want are numbers we can manipulate and display as we want. A third non-programming approach is to get an API key as shown in Step 1 below and within a few moments you can create a URL that you can use in a browser to return data. It is pretty low tech, but it works wherever you are. 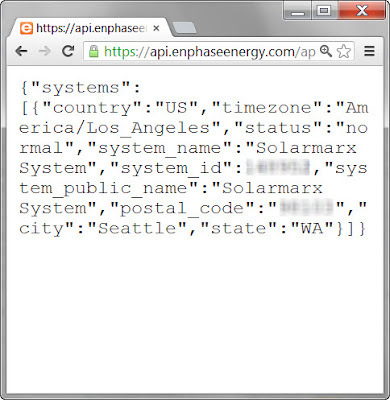 Here’s an example of an URL: https://api.enphaseenergy.com/api/systems?key=<YOUR_KEY_HERE>. More examples are shown in Step 2 below. Before we start in with the tasks, let's list the software components and hardware components we are using in the tutorial. A Web service built with C# and a simple web page to display the results from that web service. Both are running in a free Windows Azure web instance. Why a web service? We can hide our Enphase API key and the web service is easy to create and use. You can have code for retrying or aggregation of different streams of data. Also, the web service can be leveraged from other clients (applications on other devices). Why Windows Azure? Because we have a number of other projects hosted there and it made sense. They offer a free web site solution that is easy to use. Is a hosting solution like Windows Azure necessary? No you can host the web service and web page on your local computer and it would work fine. We wanted to host the service in the Cloud so we could access it remotely. What operating systems did we use for this tutorial? Development was done on both Windows 7 and Windows 8. Why? It’s easy to use jQuery in a web page to call the web service we created and put the data on a web page. 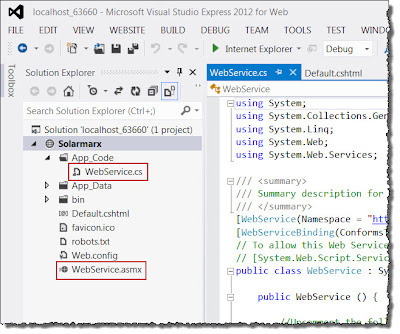 WebMatrix or Visual Studio - development tools that can publish to a Microsoft Azure web instance. Why? Free and relatively easy to use tools for creating web sites. The web sites can be used locally only and also published to a remote web site. Why? Well, because this API provides the access to the data about our system. Thankfully, it is a fairly simple API to use with query strings that require your “key”. With each “call” to the API you can get different types of data back. Sample code files for this blog post can be downloaded from Github. 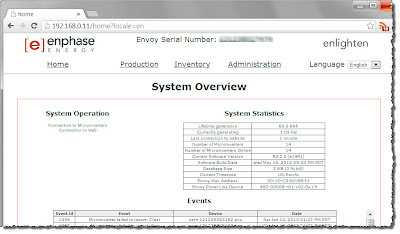 The Enphase Envoy Comunications Gateway connects to a router (https://enphase.com/en-us/products-and-services/envoy) which talks to the Enphase web service. The Envoy in turn communicates with the micro-inverters that convert DC to AC, one for each solar panel. The solar panels were designed and installed by Solterra Systems. Step 1: Get Your Enphase API key. Go to https://developer.enphase.com/docs/quickstart.html and follow the instructions. The root URL for the API is http://api.enphaseenergy.com/api/. Assuming you have your API key, you can easily test the API calls in a browser. Note that some browsers show the returned JSON by default, other browsers might force you to open the file in another application (you can choose any program that can display text). Your API key is 32 characters long. For the sample URLs here we’ll use the example key = “11112222333344441111222233334444”. Other data below is displayed with XXXXXX to hide our system ID (different from the ID used in the public system URL above). Your system will show the appropriate data for your setup. There are as many items in the list as there are 5 minute intervals in the day. For example, for a day with 8 hours and 45 minutes of daylight, that's 525 minutes of daylight and 105 intervals. For more information, see the stats call. Specify summary_date for a specific day. All the code shown in this step and the next (Step 4) will run locally and don’t require a remote web site. If you you only want to experiment with a local web site (on your computer), just skip the tasks that talk about creating a Azure web site and publishing remotely. 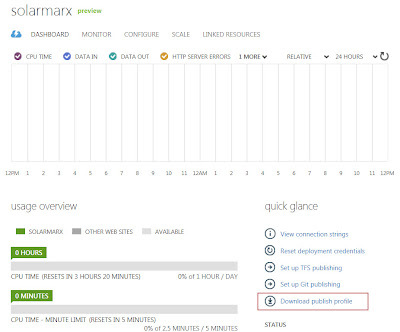 Step 3.1: Go to https://manage.windowsazure.com, create the site and download the publishing settings for the site. 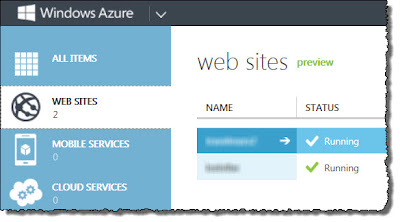 Assuming you already have an account established, you will create a free Azure web instance. In the Windows Azure Free instance, your web site runs in a multi-tenant environment, that is, you share resources. This is fine for what we are doing here. We call the site in this tutorial “solarmarx” which gets the domain name http://solarmarx.azurewebsites.net. Call your site something appropriate for your situation. If you wanted to have a custom domain (like www.mycustomdomain.com), you can do that as an extra step. 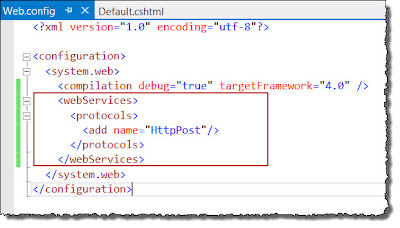 After you create the site, download the publishing settings which are used to tell you local programs (WebMatrix and Visual Studio Express) how to publish to the remote web site (in the Cloud). Step 3.2: Create a local web site. 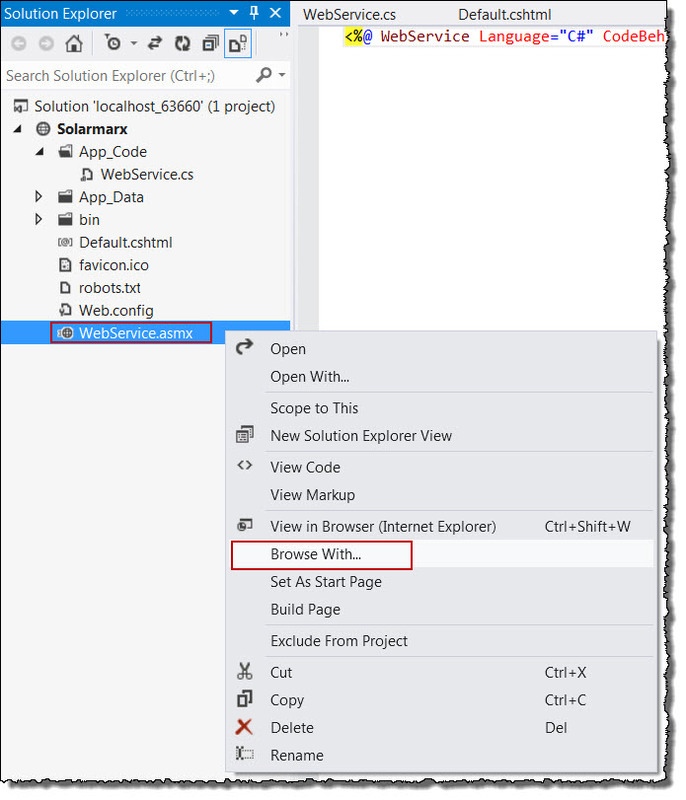 Create a site using WebMatrix or Visual Studio. Create an empty site then associate the site with the publishing settings. You can also create an fully functional local site first and and test it locally and then later associate the publishing profile. Step 3.3: Make a change to your web site locally and publish to the remote site and verify. For example, edit the title of the Default.cshtml document and put some text in the body of the HTML file. Select the Default.cshtml, right-click, and select Publish. 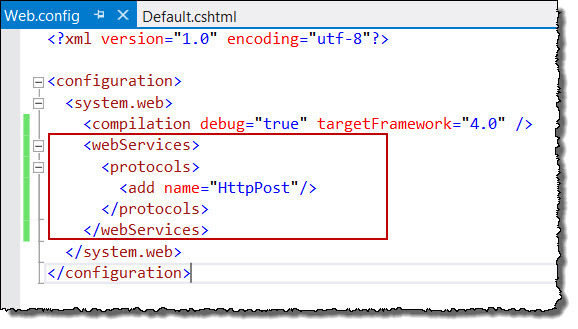 Step 3.4: In the Azure Management Portal for the web site, make sure Default.cshtml is one of the default document types for the web site. Go to the Configure page of the web site and look for the default documents section. Add Default.cshtml as a document type. 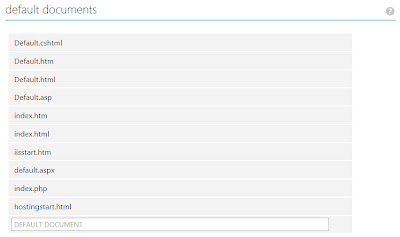 In this step of the tutorial, we show using Visual Studio Express 2012. You could also do the same work in WebMatrix2. You have several options for working with the web site you created. 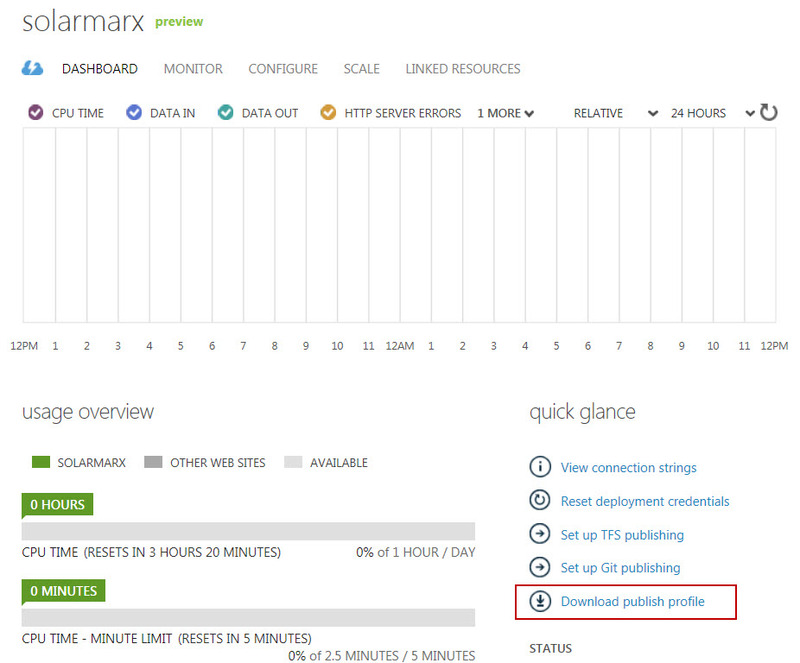 To open the site in Visual Studio Express 2012, use "Open Web Site" and find the Local IIS web site "Solarmarx" in our case. 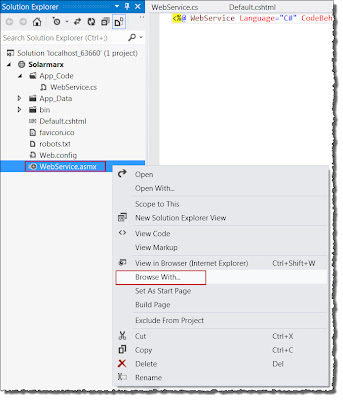 Step 4.1: Create a web service by create a new .asmx file. Step 4.2: Put the code into the WebService.cs file as shown below. Below, an example key (11112222333344441111222233334444) is used. As well XXXXXX is used as the system ID. Fill in the correct values for your system. Step 4.3: Test the web service locally (on your computer) by selecting the WebService.asmx and browsing. Step 4.4: Create a basic web page that uses jQuery. Install jQuery in a \Scripts folder. 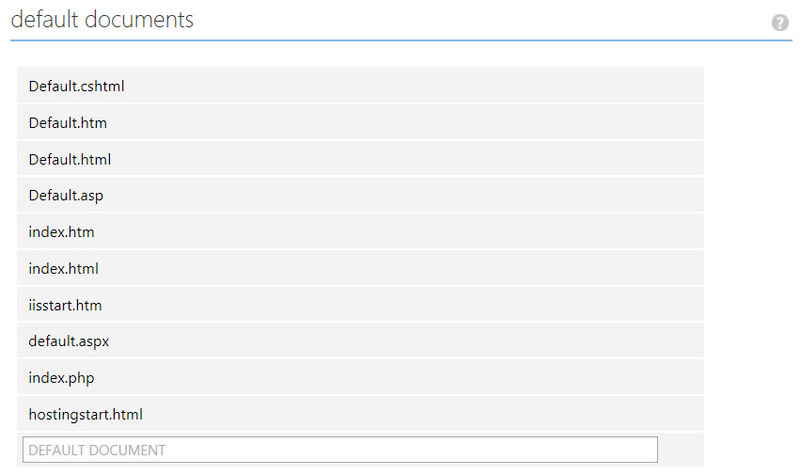 You can use the NuGet service to do that. Step 4.5: Modify the web page as shown below to add script that calls the web service and puts the results in an HTML element on the page. Step 5.5: If publishing remotely, you need to set configure HttpPost as a service that can be used. This is done in the web.config file. Step 5.6: Test locally, publish to the cloud (if you created a remote site), and test remotely.